Oh, where do I begin? 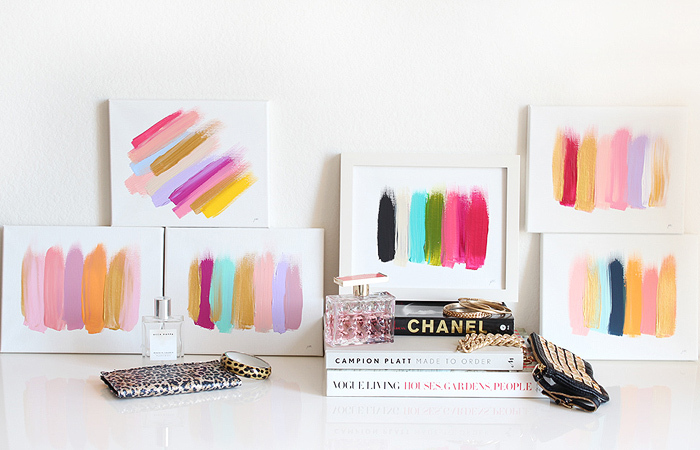 Jen Ramos of MadeByGirl, is an entrepreneur, artist, & blogger, and is just one cool gal. She seems to do it all, and with such style and ease. It almost makes me Kelly green with envy. Okay, it totally makes me Kelly green with envy. I was lucky enough to receive one of her 8"x10" paintings for Christmas last year and I am hoping to get one of her larger ones sometime soon. They are absolutely gorgeous and the color combinations she chooses are impeccable. Just last night I received an email from her at 10pm letting her subscribers know that she had added more paintings (including 2 large ones) to her site. Sadly for me, by the time I checked her site out at 10:46pm, the 2 large ones had already sold out! I know, I should've checked my email earlier but I was getting ready for bed and totally didn't hear my phone buzz. Lesson learned though because I will be on high alert the next time she announces that she is about to add more paintings to her site. To soothe my frustrations on missing out on the 2 large paintings, I purchased another original art offering of hers - Painted Notecards. They're just as gorgeous as her paintings and have a lovely Bible verse printed on them. I think I will definitely frame one and place it in the nursery. Oh my God, I'm OBSESSED with this girl too! from her gorgeous works of art, amazing blog and home tours.. I can't get enough!! Will be ordering from the new batch, I just HAVE to have one. I've been eyeing her gold LOVE print too.. might start with that one..